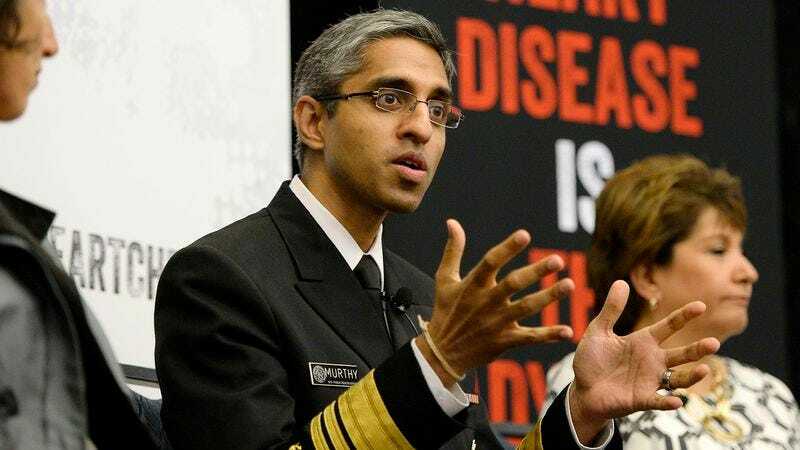 WASHINGTON—Highlighting the benefits of brief, infrequent aerobic activity, U.S. surgeon general Vivek Murthy urged Americans Friday to make sure to exercise once every few months during a frenzied moment of panic regarding their health. “It’s important that citizens of all ages, genders, and backgrounds make the time every four to nine months to go for a quick jog or do 15 halfhearted push-ups in the midst of a frantic surge of concern about their physical fitness,” said Murthy, who explained that individuals need not possess a gym membership or their own exercise equipment to engage in twice-yearly anxiety-fueled attempts at working out, and could instead simply perform five to 20 minutes of various calisthenics in their own home during a short-lived fit of worry spurred by an increase in their weight or a feeling of general decline in their well-being. “Whether you see a troubling news report on the risks of heart disease or suddenly take note of the condition that one of your parents is in and figure that you’re on track to end up like them one day, the key is to just get out there and exert yourself on a bike, or a treadmill, or with a set of weights in those fleeting few minutes that you feel alarmed enough to try to stave off a potential health crisis. And for optimal results, we strongly recommend getting into a regular routine of repeating this process every half year or so.” The surgeon general also recommended that all Americans spend three and a half days on whatever the current fad diet is any time they find themselves feeling particularly guilty about the amount of fast food they’ve been consuming.